BREAKFAST Individual quiches make any breakfast or brunch special. Make the crust the night before for a quick and easy morning! For the Crust: In the bowl of a food processor, pulse together the flour, salt, and sugar. Add in the butter and process for 10 seconds or until the mixture resembles coarse meal. With the processor running, add in the cold water one tablespoon at a time or until the mixture starts to come together. Form the dough into a thin disk. Wrap in plastic wrap and refrigerate for at least 1 hour or overnight. For Individual Broccoli Quiche: Preheat oven to 375º F.
Blanch the broccoli florets in a pan of boiling water for 1 minute. Drain and set aside. In a bowl, whisk together the milk, heavy cream, eggs and egg yolk. Season to taste with salt and pepper. Roll out dough on a lightly floured surface until it is 1/8-inch thick. Use a biscuit cutter to cut out circles of dough to fit each ramekin. Coat each ramekin with non-stick cooking spray. Fit the dough rounds into the ramekins. Sprinkle half of the cheese into the bottoms of the crust-lined ramekins. Top with the egg filling, distributing it evenly among the cups. Top with broccoli florets and remaining cheese. Bake until puffed and golden, about 30 minutes. Cool slightly on a wire rack. 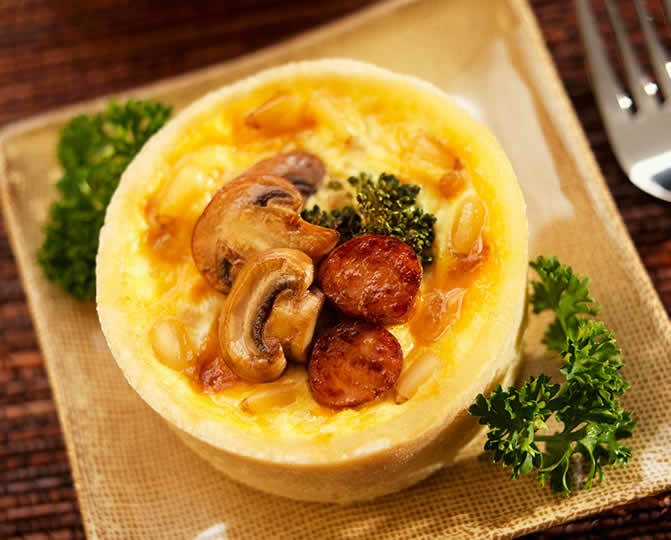 Serve warm topped with sausage, onions and mushrooms. For the topping: While the quiche is cooking, heat the olive oil in a large skillet. Cook the sausage, onions and mushrooms until cooked through and nicely browned. Note: This recipe is based upon using large size ramekins. You can adjust the number of servings of the recipe by using smaller ramekins.